Humbucker on bridge and neck, no need for single coils. Hey Tak i've actually been looking at a custom RGA7 with these specs. Bolt on 24 fret neck with matched headstock and small offset dots, either rosewood or ebony fingerboard. Flamed Maple top, trans red. Actually the Identical colour as Buzz' which he posted in this thread earlier. Dimarzio D-sonic 7 bridge and Paf 7 neck. That would be my ideal guitar right there. I've been wanting an excuse to jump on an RGA, this would do it. What are the odds on getting specific Dimarzio Pups installed from the factory? IMO, Tone Tone 7 and Air Norton 7 would be ideal, but opinions vary. Simple inlay scheme too, like blank except the 12th fret. Fretboard wood / color options would be nice too. Obviously you have to stick to a tighter set of options, but if you don't ask, you'll never find out. Thanks for being a liaison for us all, Tak. what would you like to see on this guitar? You want a bolt on guitar or neck through? How about tremolo or non tremolo? How much price range should be? Please give us little more specific detailed information. I can't promise you guys anything yet but I will present "RGA7" idea to the Hoshino Gakki guitar meeting next time. First off, thank you very much Tak for taking this up on our behalf. It means a lot! Neck: Bolt on would be fine for me. The UVs, 7620s and 1527s all have great necks so I'd be more than happy with that. The UV777PBK profile would be awesome I would love to see the old school RG7xx fretboard return if possible, with the binding and inlays, but anything would be fine. The old school touch would be great though. Trem: the new Edge-Zero 7 would be fine by me as well. If I were Ibanez, I'd have two series of RGAs: With floyd and without. That body looks way better than the regular RG...for some reason I never really noticed until a few days ago. yep, what makes a RGA is the carved top, not the fixed bridge. Prestige - Made in Japan!!! I really apreciate your time reading this thread!!! We know you can realise our dreams and make'em come true!!! just make a RG1527 with RGA body, transparent color and please no more Cosmo Black parts. Did i said i'm tired of faded Cosmo Black hardware? Black hardware looks NEW for ages! Thanks for taking the time to view this Tak. - Inlay on 12th fret only. - Trans color, anything but black, like suggested above. - Price similar to RG1527. +1 and vintage violin or red over blue any day. Excellent! 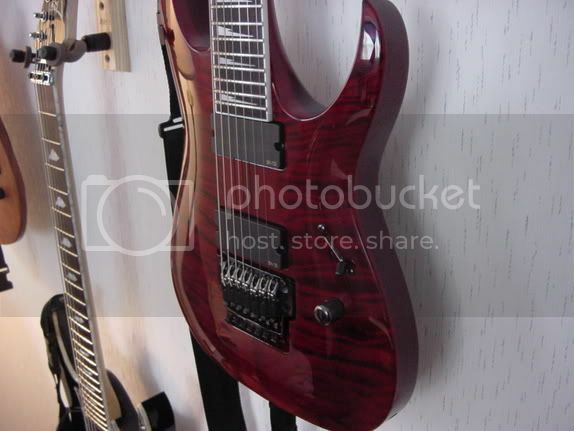 You are talking to the worlds biggest Ibanez seven string fan over at seven string.org. I think a huge part of the desire for the RGA7 was brought about because of Buz McGrath's RGA7, so something similar to that. Ideally, something different from everything else that is out just now - so a neck through would be nice, and definitely a transparent stain. Its been almost 4 years since we had a colour other than black or royal blue, so something transparent, harking back to the days of the S7420FM and the RG2027 would be great. Bridgewise I'd rather not see the Edge Zero - I'd love to see the Lo Pro brought back, or failing that the Edge Pro, but the ZR and Edge Zero's hold little interest for me. :shrug: The Edge FX would be nice, since that isn't currently available in a seven string. In fact, waht I'd love is the wraparound thats on teh RGA321's just now - we have one in our shop and it feels absolutely fantastic - it'd be nice to see that as a 7 string version. A reverse headstock would be fantastic too. The XPT-707 has one and looks awesome, and again I feel that mirroring that particularly fine instrument would be a great idea. Also...an ebony board? Maybe asking a bit much, but we haven't seen one of those in a long time. (Did they die with '04 Jem7VWH having a rosewood board? :scratch but having one on a seven would once again be fantastic. I'd honestly suggest checking out sevenstring.org - every single "post your dream guitar" comes up with several posts of "Buz McGrath's RGA7" so its obviously something special. Thanks for the oppurtunity for this - it's been rather eagerly awaited. NB - I've tried to keep my specs realistic to what would appear to the maximum demographic - maple boards and swirled finishes are nice, but this a case of being practical and making a PRODUCTION instrument, not a custom one to everyone's specs, so LED markers and Lundgren pickups are just ridiculous. hell, a black Edge Pro 7 would also be very nice! Bolt-on or neck-thru would be fine with me. I prefer a non-tremolo, but i'm sure folks would love both. My current favourite configuration is a floating tremolo bridge with locking tuners instead of a locking nut, and a Tremol-No in the back. (This is how my Music Man JP7 is configured, and i love it.) It gives the option to lock down the bridge for ease of string changing and playing with alternate tunings without having to touch any tools, and can be unlocked to full-floating mode when the need arises. Price range: Less than $1000 would be nice. But i'm not picky about it being a Prestige instrument. I've played some VERY good Korean- and Chinese-built Ibanez guitars (the Artcores are insane value for the money, and quite impressive guitars in their own right). Other considerations: It'd be nice to see a couple of different models ranging from the low end to the high end. A bolt-on, fixed-bridge, oiled mahogany model at the low end, to a neck-thru, exotic wood, trem-equipped model at the high end. I think many players are starting to favour minimal inlays (or none at all) on the face of the fretboard. The clean, uncluttered look is really nice, and i think a lot of players are realizing that they use the side dots more. Oh, and i think on a 7-string RGA, a 4+3 (or 3+4) headstock based on the one used on the new SZR models would look REALLY good. trem (lo pro) with PIEZO!!!!!!!! !